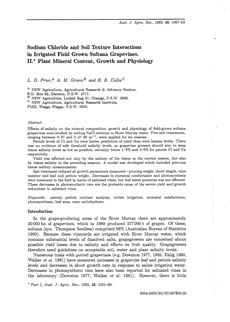 Effects of salinity on the mineral composition, growth and physiology of field-grown sultana grapevines were studied by adding NaCl solution to River Murray water. Five salt treatments, ranging between 0.37 and 3.47 dS m-l, were applied for six seasons. Petiole levels of Cl and Na were better predictors of yield than were lamina levels. There was no evidence of safe threshold salinity levels, so grapevine growers should aim to keep tissue salinity levels as low as possible, certainly below 1.5% and 0.5% for petiole Cl and Na respectively. Yield was affected not only by the salinity of the tissue in the current season, but also by tissue salinity in the preceding seasons. A model was developed which included previous tissue salinity measurements. Salt treatment reduced all growth parameters measured-pruning weight, shoot length, cane number and leaf and petiole weight. Decreases in stomatal conductance and photosynthesis were measured in the field in leaves of salinised vines, but leaf water potential was not affected. These decreases in photosynthetic rate are the probable cause of the severe yield and growth reductions in salinised vines.